It's November in the Canadian Rockies and cross-country skiers are flocking to Lake Louise in droves for the season's first ski trip. The Destination: Moraine Lake via the paved summer road, snow covered, groomed and track set by mid November most years for classic and skate skiing. 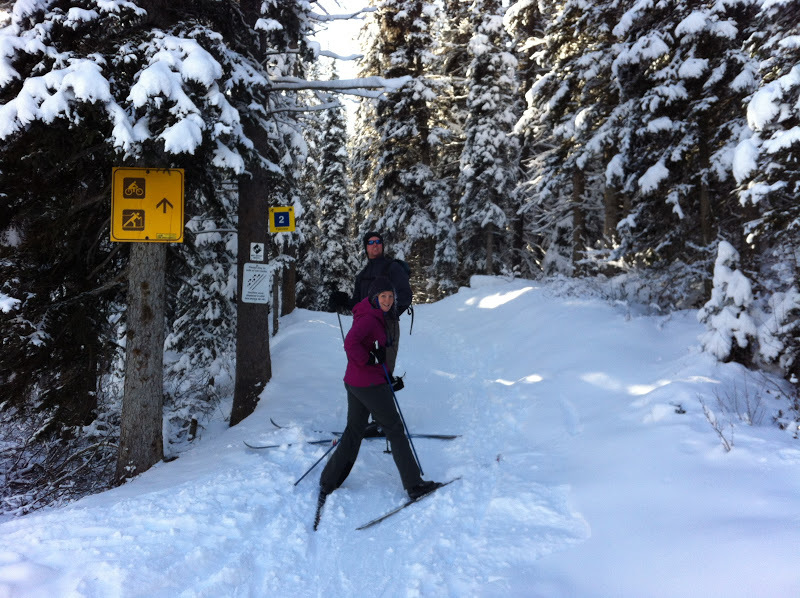 It's always the first trail in condition for skiing each winter and the parking lot fills up quickly on weekends. 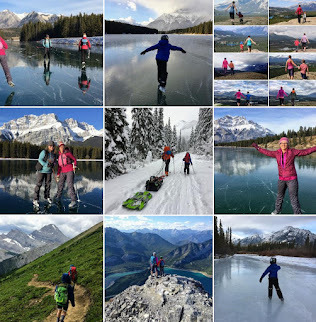 We'd originally been planning on ice skating this past weekend until early snow fell and pretty much ruined any chances we'd have for a November skating season in Banff. Never a family to let snow ruin our weekend though, we decided that hey, we could go skiing instead of skating! Skiing on November 10th! That could almost be a record - and probably is for us anyway. 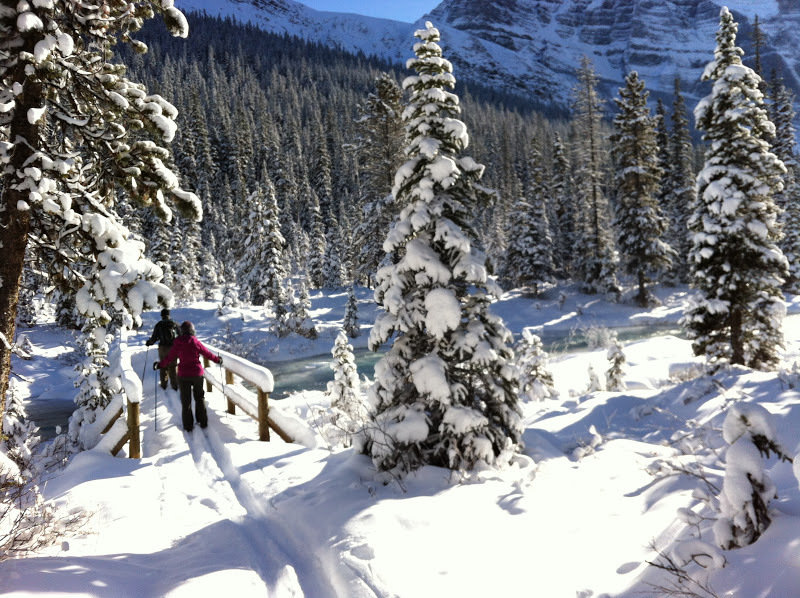 Our destination of the day: Paradise Valley at Lake Louise! A glorious 20km return backcountry ski tour (if you do the full distance, go equipped with full-on backcountry skis and avalanche beacons, and have a tad more experience than I do perhaps. 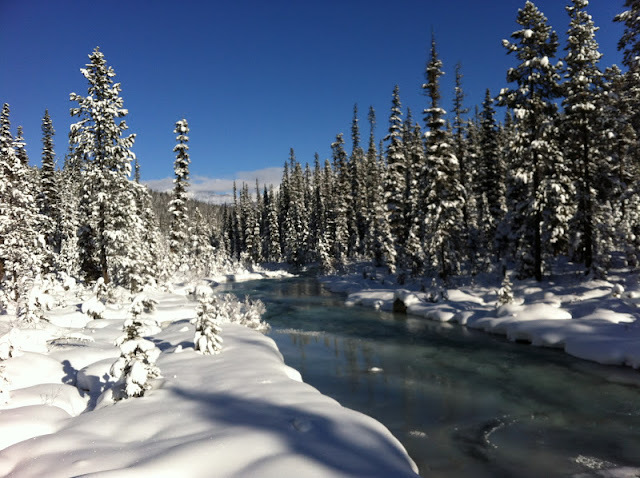 However, in 10km return (or less), you can definitely reach Paradise Valley, cross Paradise Creek a couple of times on snowy picturesque bridges straight out of a painting, and have a relatively easy day of ski touring within the capabilities of most cross-country skiers. We all used light touring skis with metal edges and definitely appreciated them because of their extra width and design for powder. Our path was certainly not groomed and we had to break trail the whole time following some old ski tracks that had been covered over by the most recent snow fall. Follow the Fairview trail until it veers off to the right. You'll see a short steep hill in front of you (most likely skier tracked). This is your hill and where you leave the official trail - up you go! Gain the ridge crest and follow it until you reach the first bridge (on your left) over Paradise Creek. You won't go over the bridge unless you are taking the summer Highline Trail to Moraine Lake. It's worth going out onto the bridge though for the breathtaking views and your first glimpse of Paradise Valley. 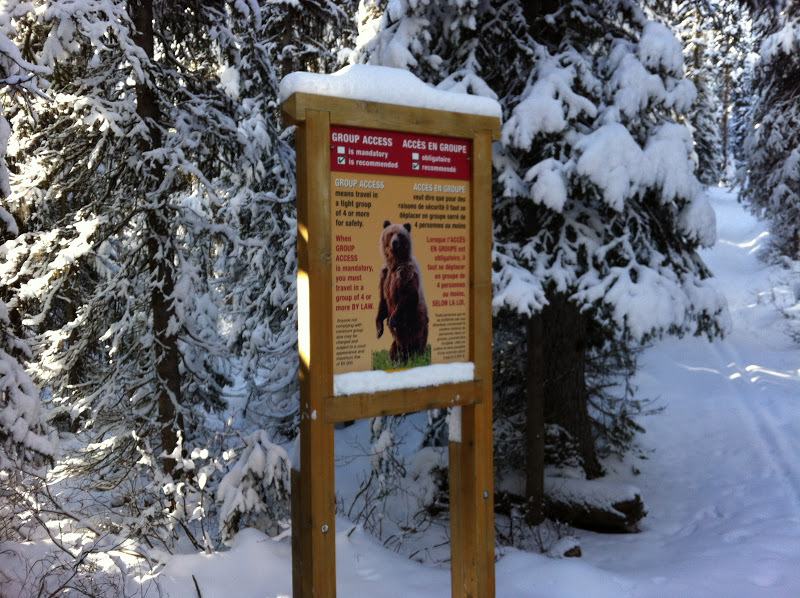 You'll also find a large wooden sign here pointing the way to Moraine Lake (left) and Lake Louise (right). 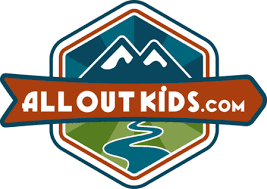 You are on the official summer hiking trail to Paradise Valley now and after climbing for a short distance (longer if you are breaking trail or don't have skins on) you'll descend gradually to reach Paradise Creek again - and the second bridge. This makes for a great lunch break and if you started late (as we did) a good turn-around spot. Otherwise, cross the bridge and continue up valley to another bridge within very short distance. 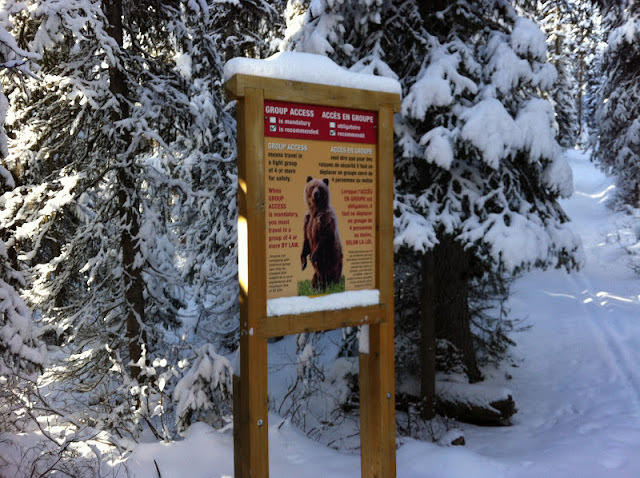 If you are on AT or Telemark skis, you can easily continue to the junction with Lake Annette or continue on towards the Giant Steps and views up valley towards the Grand Sentinel below Sentinel Pass. I've never made it past the Lake Annette junction on light touring skis and I can assure you that should you decide to continue past this point you'll need skins!! A perfect Day in Paradise Valley! Haven't done this one but will try and fit it in this winter.